The original "greenhell" without Start- and Finish-area. Most used for long-distance-tests of Manufacters and club-races. although there are still many errors, gaps, bad textures and details that would be nice to have, i decided to publish it now, as it takes alot of time that i can't afford and i guess it would not be "really finished" within the next years but i hope you like it nevertheless. *at least, i think so: h-j-s stated in a pm it would be the same license as speed dreams; my own work is gpl in this case. Textures are either taken from the older release (only tree1.rgb), from other speed dreams tracks or my own work. Oh and the map preview where you drive is pixelated. One thing, I have big frame downs in several zones of this map. Is possible to reduce this problem? But one problem, i think, is also its size. The track is 21km long, and after each curve, some other distant parts of the track get into FOV. You could try to avoid this by reducing view distance, so that the far-out, opposite side of the track is not rendered. 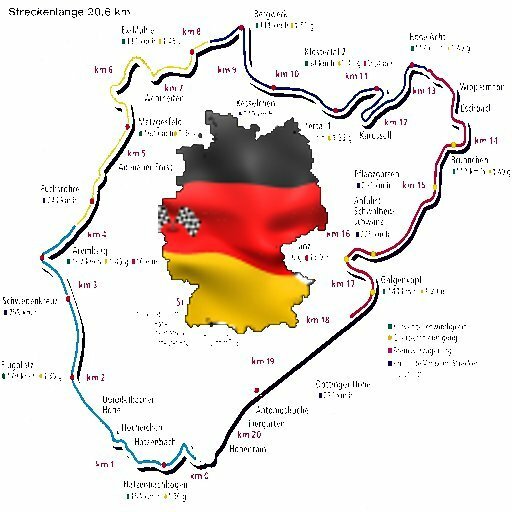 I saw that yesterday this track was included in the last trunk ( https://sourceforge.net/p/speed-dreams/ ... dschleife/ ) . I've also seen that it works with OSG, which it didn't do before, and the performance is not much better. Last edited by leillo1975 on Mon Nov 12, 2018 9:31 pm, edited 1 time in total. simon-2 wrote: You could try to avoid this by reducing view distance, so that the far-out, opposite side of the track is not rendered. I reduced visibility from 10000 to 6000, but I don't feel the difference. track is great, thanks a million for that, best track IMHO. There's some file missing in the archive file, like nbr-hotel.ac and a lot of other .ac to generate the track.